We’ve put together this extensive guide of everything we know and are asked about roller banners on a daily basis. We hope you find this useful and if you have any additions or corrections, we’d love to hear from you. Edit: Since we put this post live originally we’ve had lots of input from our clients. To say thanks for reading, we’ve put a very special 50% OFF OUR PREMIUM ROLLER BANNERS discount code in the banner just below. How much bleed do I add to roller banner designs? Find yourself changing roller banners regularly? Our roller banners have the capacity to be reskinned once or twice. This means we can change the graphics on the banner and reuse the cartridge mechanism. This saves nearly 1/3 of the cost of a new banner. Check our our roller banner replacement graphic page. We’ll even fit it for you free of charge. Roller banners are a popular large format lightweight display stand. The base is commonly made from aluminium whereas the graphic area is usually printed on to a vinyl or polypropylene substrate. Most commonly used as a marketing display tool, roller banners are referred to by many similar but different names, including: roll up banners, pull up banners, penguin stands and pop up displays. 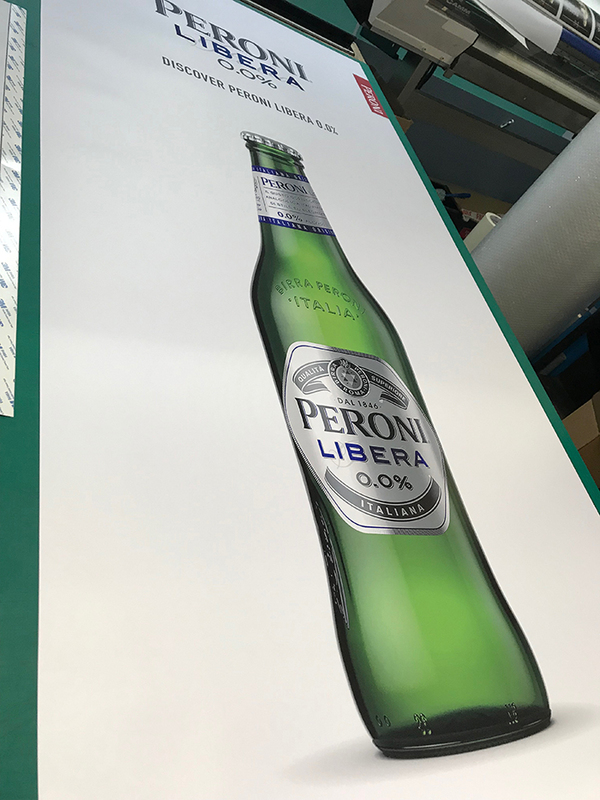 Printed on large format machines such as Roland or HP printers, roller banners are printed at 300dpi and so the print quality is defined as high resolution. Many suppliers of roller banners provide a carry case to ensure that the stand and graphic are protected in transit. A premium carry case would provide a certain level of padding where budget roller banners are supplied with a case that has no padding at all. 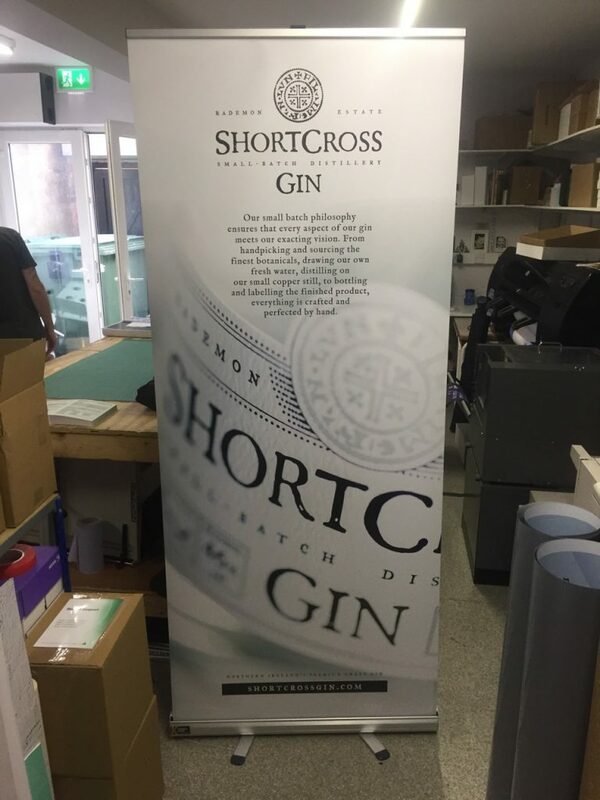 Very cheap roller banners may be supplied with no carry case, however if this is the case we would suggest you invest in a box or alternative method to transport the banner in as frequent knocks or bumps may damage the roller banner beyond repair. 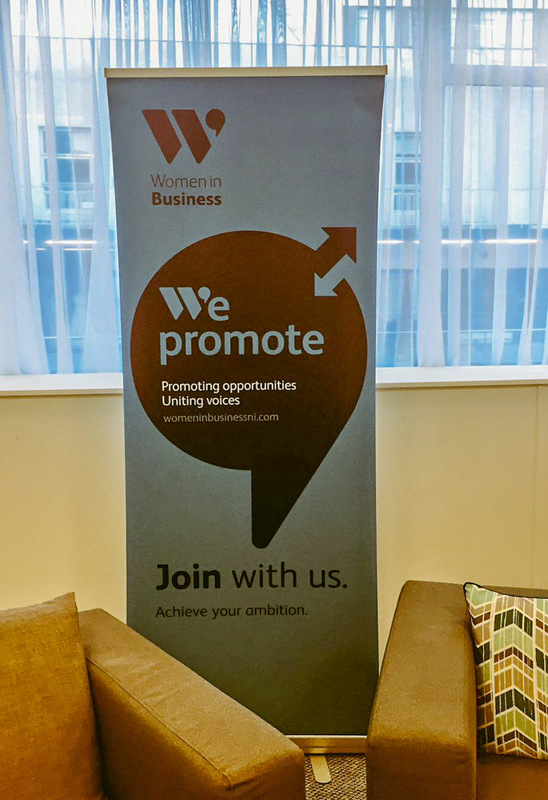 At 2 metres tall and just short of a metre wide, roller banners command a visual presence in any room. Perfect for backdrops to staging or for use in promotional photos, they are extremely versatile in their use. 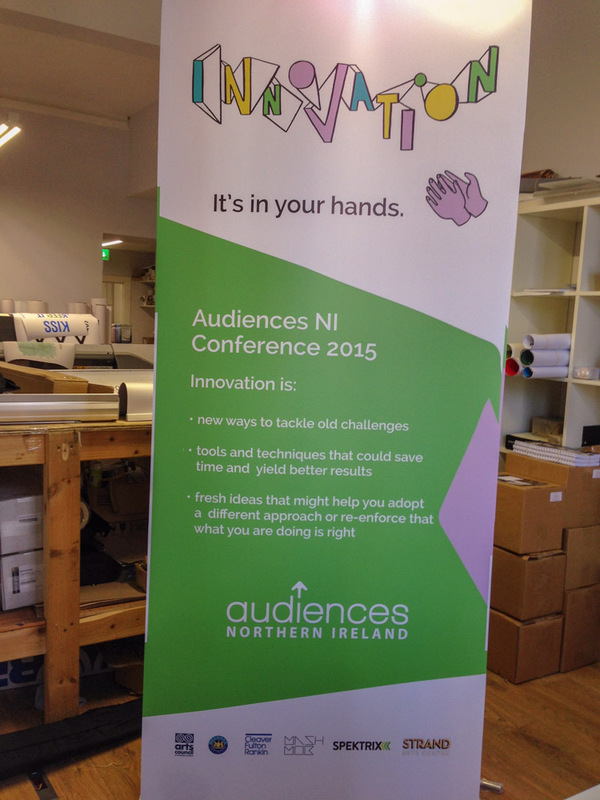 Roller Banners shouldn’t be costly and prices start from under £100 at many printers all across Northern Ireland. The value from roller banners comes from keeping them generic in their design so that they can be used right across all facets of the business. One banner can have so many uses. Photo Prop, Staging Background, Welcome Banner in Reception and Event or Exhibition Graphic. From unpacking to assembling a standard roller banner and be set up in less than 30 seconds (and we have the video to prove it). Take down is equally fast and can be managed by a single user. Roll up banners generally weigh less than 3kgs and so transportation away from your business is not generally an issue. Pop up banners are built to last. 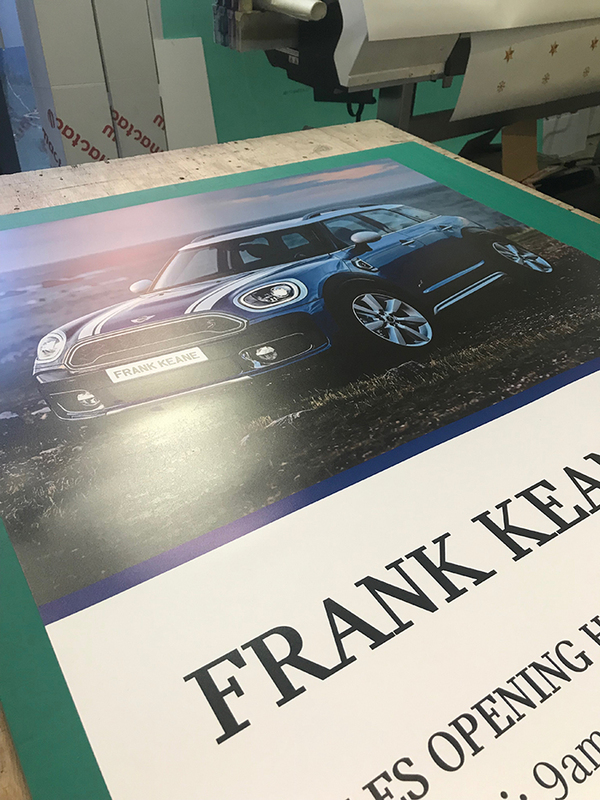 Not only is the aluminium base extremely sturdy, but the polypropylene graphic and fade resistant inks ensure that your banner is built to last. A premium roller banner should also come with a carry case, preferably padded so that even when being stored, your stand is protected. 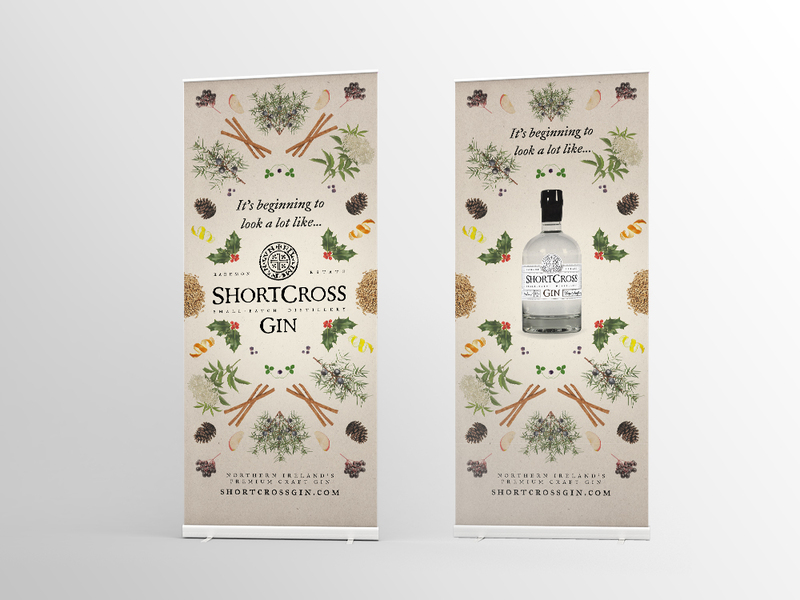 Using our premium roller banners as an example, each banner is less than a metre in width. 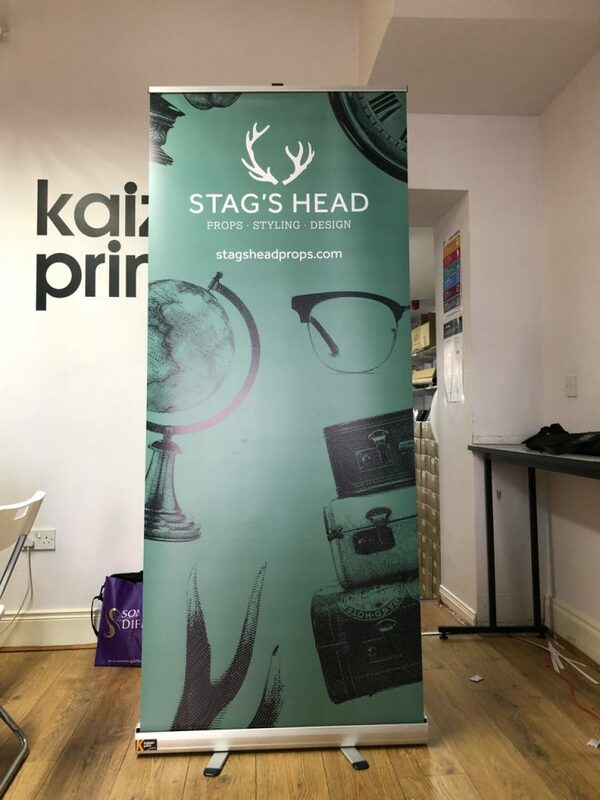 The heigh and depth of the banner is less than 15cm each and so by it’s very design, when the graphic is stored within the base, it is super compact. For extra convenience the pole supplied can be split into three elements and neatly stored in the back of the aluminium base before putting into the carrier case. This way all elements are contained in the one package at all times. We understand many of our clients are proficient designers, however some clients are just starting out or have little experience in designing roll up banners. With this in mind, we’ve set up some templates using best practice techniques: Adding the right amount of bleed and keeping a safe margin on your design. We’ve created an illustrator, indesign and photoshop pdf set of roll up banner design templates. If you are unable to use these or do not have the correct software, our design studio would be more than happy to review the project for you. Some of our work is shown in the gallery below. Designing a roller banner shouldn’t be difficult and following our simple tips below you should be in the perfect position to get the most from your banner. Even if you are not a graphic designer, sketching out the design will enable your graphic designer the ability to work quickly and this will save you some time and money. If you can’t read and understand the information on your roll up banner in less than 3 seconds, you have too much information on it. Are you launching a new product or just want a roller banner that provides generic awareness of your brand? Before you begin designing you banner, have a clear objective of what you want to achieve and how you hope to do so. This will result in a much better overall finished product. When planning the design of your roller banner, remember less is more definitely more. Logo, core message, contact details and relevant imagery are the key to a great roller banner design. Investing in high quality photography or stock imagery will make the difference in how your pop up banner looks. Make sure your imagery is at least 300dpi and the colours have been converted to CMYK as opposed to RGB. Remember roller banners are meant to be sign posts and not your entire proposal. They should be concise and present the right information so that your potential customers can contact you if they choose. Extra wide Roller Banners – defined as any roller banner over an 850mm width. Most extra wide roller banners are 1200mm wide. 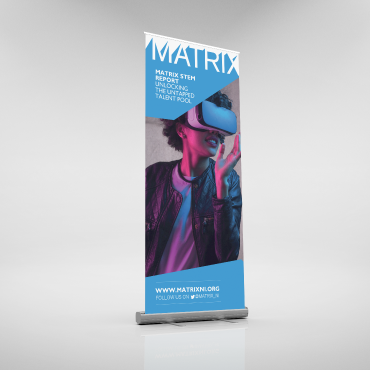 Double Sided Roller Banner – a banner with two graphics that can be used independently or together to create a stunning visual impact from 2 directions. Each banner can have different graphics and so used for different purposes. Single Sided Roller Banner – the most common of all roller banners, this is a cost effective exhibition stand that provides stunning visual impact up close and from afar. 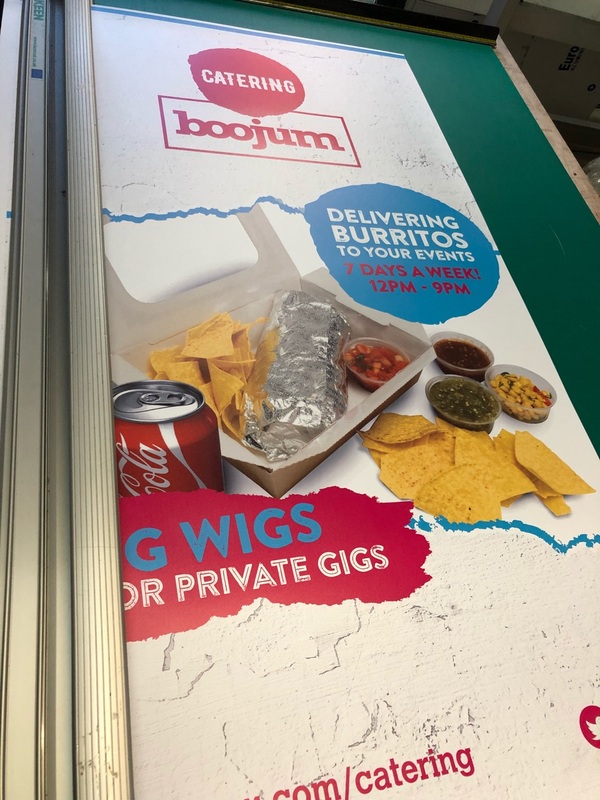 Pull Up Banners are most commonly available from printers within your city, however with the advent of e-commerce stores they are widely available online for delivery to your office or home within only a few days. If you have little or no experience with ordering printed goods online we recommend you visit your local printer and ask to be shown a sample of the print and how the mechanism works. By doing so you’ll get a great understanding of the banner and how it can be put up and down. Any good printer will also provide the service of checking your artwork before printing. If you bring your artwork on a USB or disk, this would be the perfect time for their artwork or production team to check this on your behalf. When looking for printers who supply this type of product, search for large format printers or signage and display companies. These type of printers are better suited to this type of product than say litho printers who print a much different offering. Ask which type of printer they will be printing your banner on and what type of ink they intend to use. We recommend HP or Roland printers and eco-solvent, latex or UV inks as these are generally waterproof and resistant to fading in sunlight. If your printer suggests using DYE inks this would be a big no no, as without lamination to stop the ink drying out, the artwork will fade immeasurably in a short period of time. 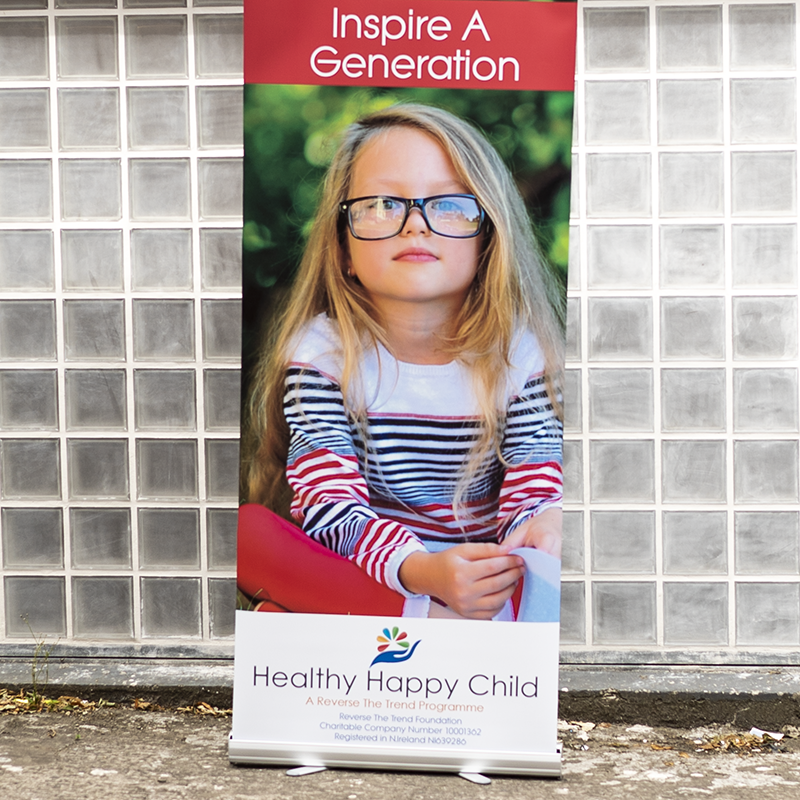 Roll up banners are commonly used in schools, offices, showrooms and at events and exhibitions all across the country. 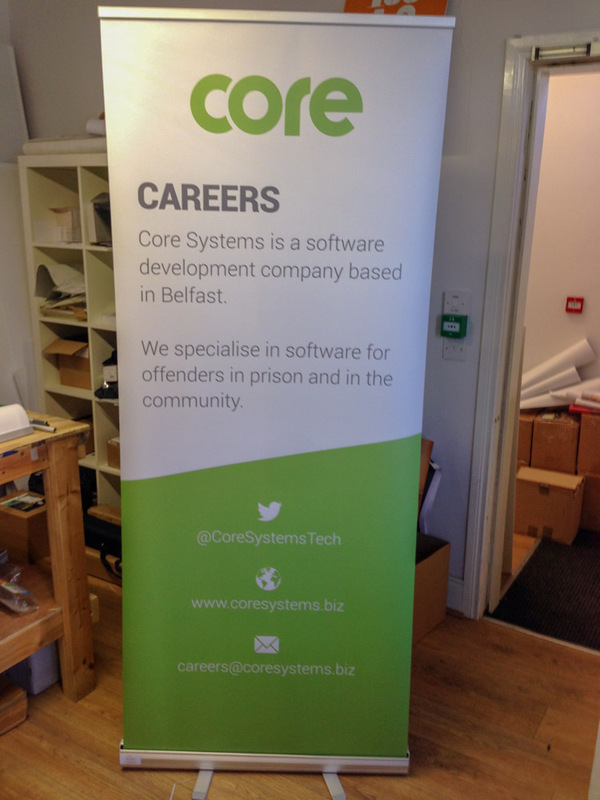 We’ve placed roller banners in banks, shopping centres and within job centres and credit unions. 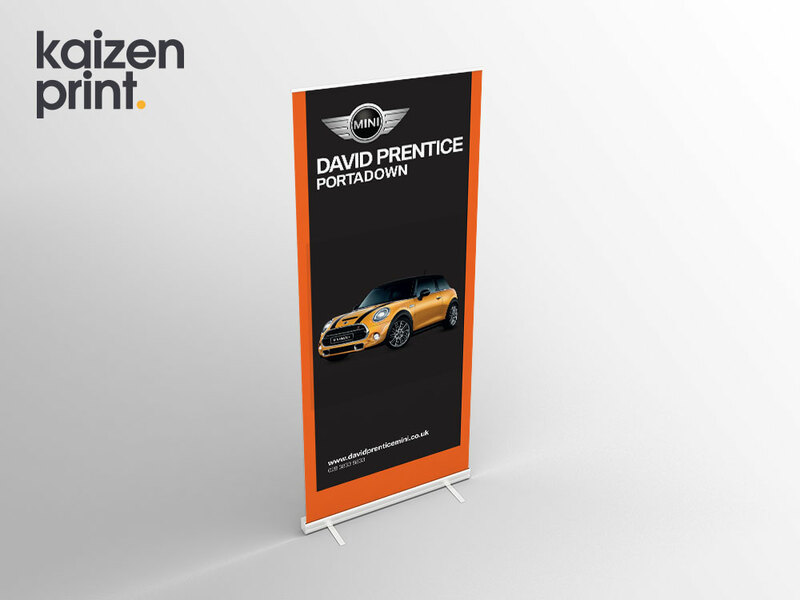 Due to their slimline shape and small footprint, roll up banners are perfect for almost any location. 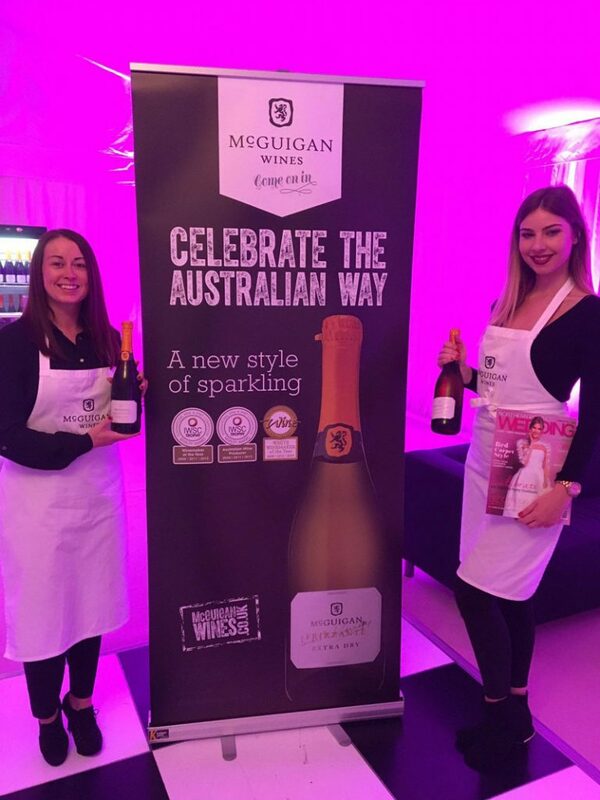 At promotional events we regularly see roll up banners being used as media walls or photo backdrops. Using 1-3 roller banners side by side provides a sizeable background image against which to take photos. Sometimes online you’ll see roll up banners touted for outdoor use. While the individual elements of a roller banner are suitable for use outdoors, when made into a roll up banner, the combination of base and large graphic will act as a huge sail and so the banner would be susceptible to high winds and may blow away. This in our opinion would rule out the use of outdoor roller banners and leave this firmly for indoor purposes only. We recently received our order for 4 rollup banners. From start to finish, the service was brilliant. There was an issue with one of the images on our banner, but kaizen spotted this and we were able to fix this before printing. I ordered our banners via Samantha. She was prompt to reply and answered any questions I had about our order. The banners are on a half price offer right now but I have ordered from kaizen before and these are exactly the same banners I have received from them previously. For value and purpose, it’s hard to think of an alternative to using roller banners in your business. For more long term or static displays, foamex printing is a great option and serves a variety of uses. For larger exhibition displays, we recommend media walls. Usually 2.25m x 2.25m fabric media walls offer a larger backdrop in front of which to present your business. This is at a much different price point however. We hope you have found our ultimate guide to roller banners useful and we’re always open to ways to improve this guide, so if you have any suggestions, please do get in touch. If you need roller banner design or roll up banner print, we’d love to look after this for you also. Some people like to size their roll up in cm. In this instance our banners are 85cm x 200cm. Our roll up banner size in inches is: 34in wide x 80in tall. 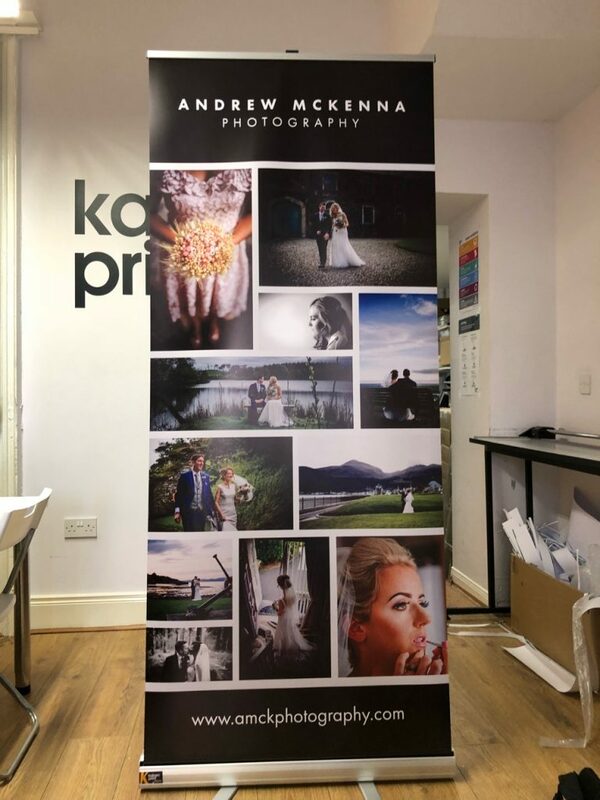 By keeping to standard pull up banners sizes, printers are able to set up templates, buy materials and systems in bulk and thus keeping the cost of pull up banners as cost effective as possible. Other than standard pull up banners, it’s wise to consider double sided roller banners also. The most common double sided roller banner size is 850mm wide x 2000mm tall. The most common size of roll up banner is 850mm x 2000mm tall. I’m a bit stuck, can you help with design? Over the last number of years we’ve designed & printed thousands of roll up banners for businesses all across the UK. 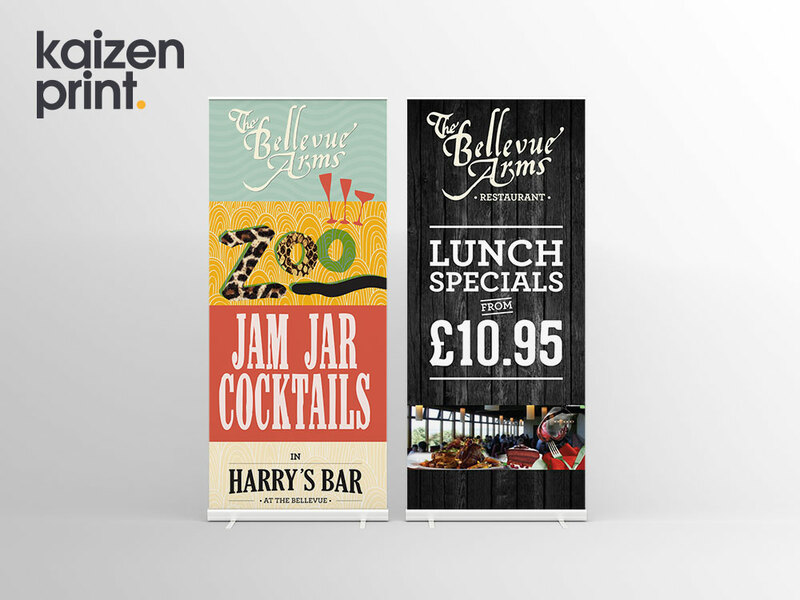 Below we have shown some brilliant design examples of banners we’ve printed to inspire your own creative. 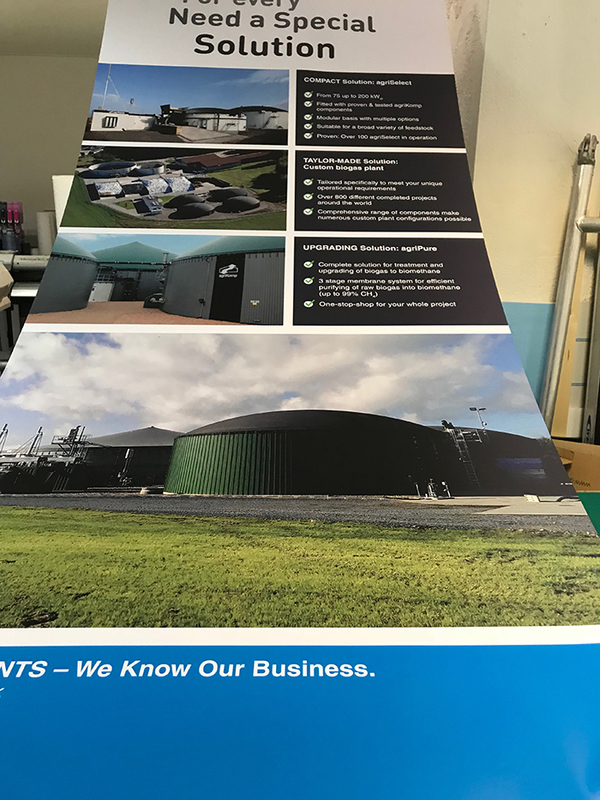 If you need us to help with roll up banner design, our team of experienced graphic designers will be delighted to create the perfect roll up banner for your business. Simply call us on 028 9002 2474 to start the creative process. How much is a pull up banner? 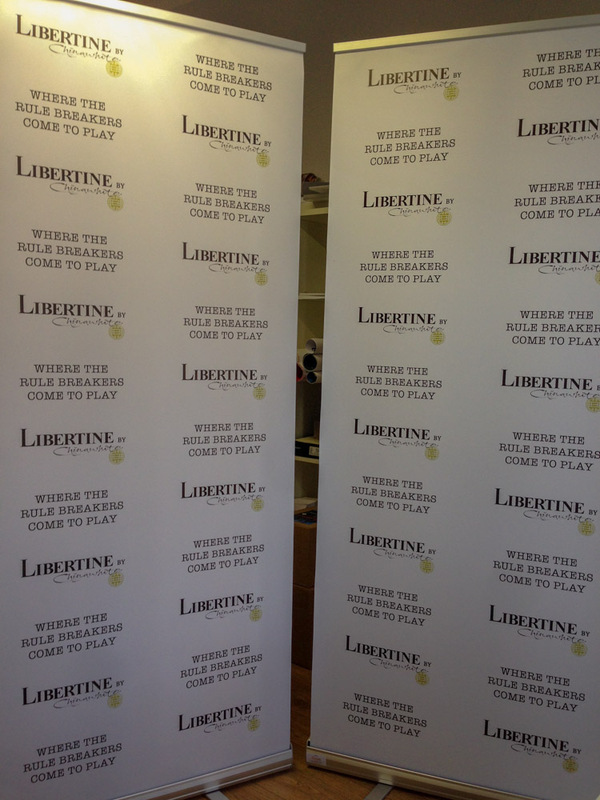 Our most popular pull up banner is our Premium Pull Up Banner (850mm x 2000mm) priced at £90+vat. To get an accurate price for your pull up banner you can visit our online printing site. All prices there are live and our pull up banners are available for purchase 24/7. Assembling a roller banner takes only a few minutes and can be completed by just one person with ease. Here is our guide for putting up a roller banner. Unzip the padded carrier case and slip the banner cartridge carefully from this. Take the pole elements from the back of the unit and assemble it to make one large pole. Feed the bottom of the pole through the receiving hole on the back of the roller banner. Ensure the pole reaches the black nubbin at the bottom of the unit and clicks into place. 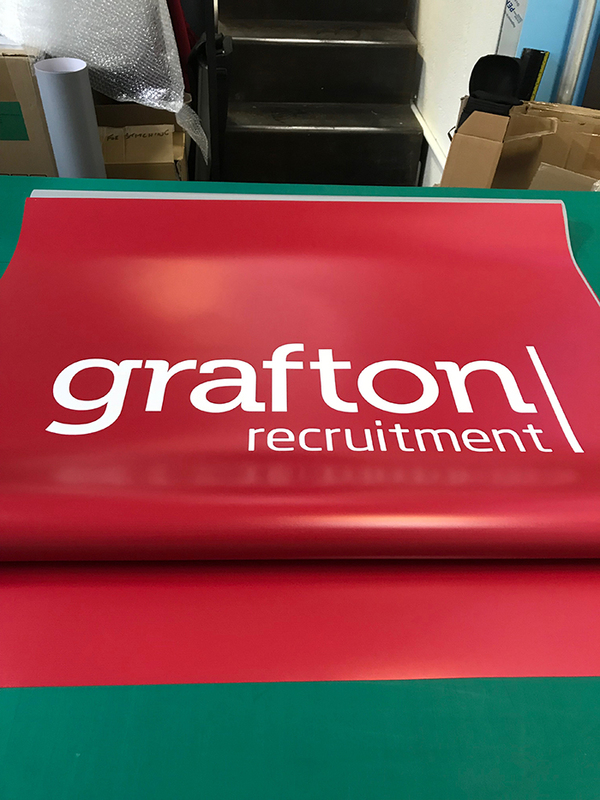 Firmly grabbing the clip rail on the graphic and with weight on the foot, lift the graphic and fit the plastic element to the top of the roller banner pole. The graphic will now be free standing. If you find that the graphic is leaning forward the pole may not be inserted properly. The only other issue that sometimes presents itself with roller banners is that they fall over. If this happens, please check that the feet are opened as this is the main reason for this issue. When taking your roller banner down after use please ensure you firmly hold the graphic at the top. 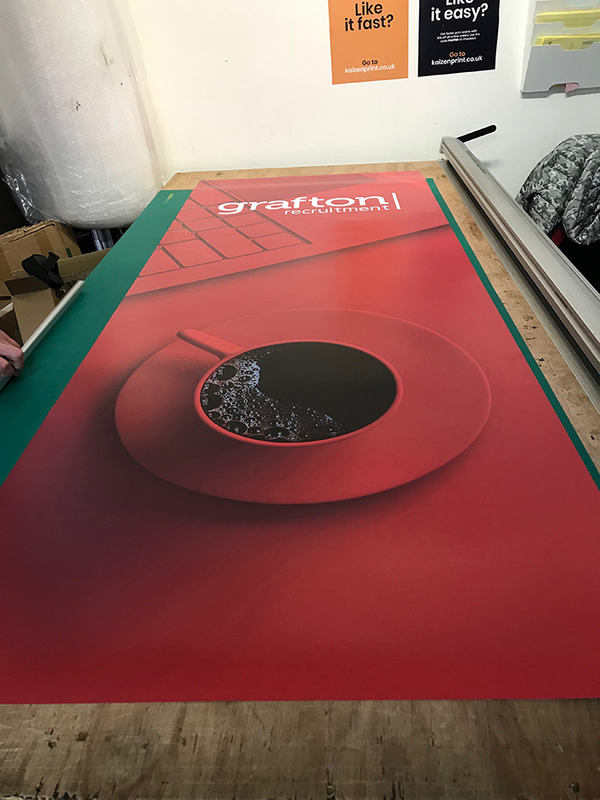 The spring loaded system does exert some force and so will need holding to slowly manoeuvre the graphic back into the roller banner base. We understand that not everyone prints or designs roll up banners each day. With this in mind, the process of setting up artwork for print can seem a little daunting. Below we’ve outlined some of the key questions we are frequently asked when designing and setting up artwork for print. 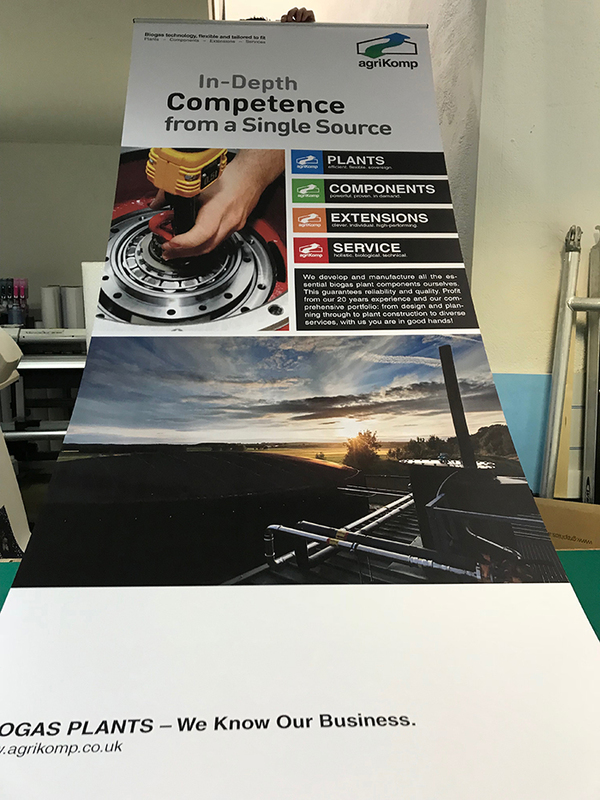 If after reading these FAQ’s you are still stuck, we are more than happy to review your artwork before print to ensure you get the desired outcome from your roll up banner project. Like all other printing, roller banners require 3mm bleed on all sides. 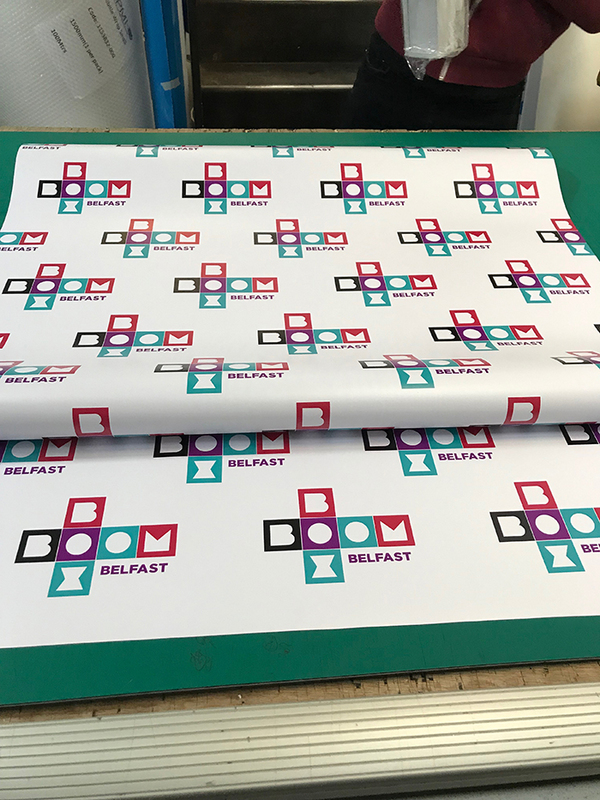 However as these are finished with one side of the graphic being attached to a base, we would also require 100mm bleed at the bottom of the print. This ensures there is no unsightly white border at the base of the graphic. In InDesign set your artboard at 2100mm tall and add a bottom margin line of 100mm. Keep your bleed at 3mm all round. It’s best practice to keep all critical text more than 50mm from the edge of your roller banner design. We also recommend that the bottom margin is greater than 100mm, as any text at this low level is unlikely to be readable. Remember roller banners are to be viewed from afar and so keep you message big, bold and very clear to read. When printing roller banners all printers will be be using the CMYK colour spectrum and so any of your RGB imagery will be converted to CMYK in print. When converting RGB to CMYK a common issue that presents itself is that the graphics darken in print. With this knowledge you should first convert all your RGB images to CMYK and check you are happy with the levels. You may need to lighten the design to your liking. As roller banners are generally to be viewed from afar we’re a little more relaxed on resolution than say how we would be on flyer printing. With a viewing distance of 1+ metres as opposed to 30cm, you can usually get away with a lower quality image. 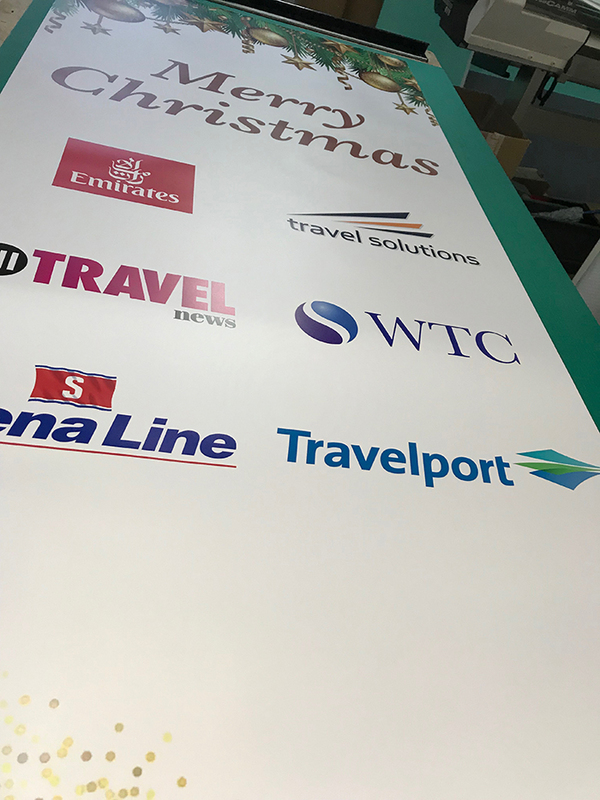 In an ideal world please present your roller banner for printing with 300 dpi images, however if some of these were 200dpi or above, you would generally get away with the print quality. Anything less than this will be pixelated and while we have many clients who accept the quality it is our practice to inform our clients before printing to ensure they make their own informed decision on print quality. Roller Banner Design is in our opinion, the most critical part of creating an effective high quality pull up banner. Yes print is the chosen medium, but what’s on the banner is much more important. Each of our graphic designers have thousands of projects experience and will help you create the perfect roll up banner design. Based in-house, you’re not working with freelancers but graphic designers dedicated to your business. Each of our team spend time with our production department daily to ensure there are no more knowledgable roller banner designers in the country. After ordering your banner, please send us a brief for the project as well as your content and high resolution imagery. If required, our designers will follow up with a phone call. We will then supply proofs for your approval or review. On sign off, we prepare print ready artwork and provide this for the print team. Professionally designed roller banner in keeping with your brand and project guidelines. 2 rounds of revisions – our briefing and proofing project is robust to get to a successful design project in record time. Graphic Design and Marketing advice from a team that have successfully completed tens of thousands of printing projects. We get asked questions every day about our roller banners and we’re more than happy to answer them. Below is a round up of some of those most frequently asked. What type of material is a roll up banner printed on? 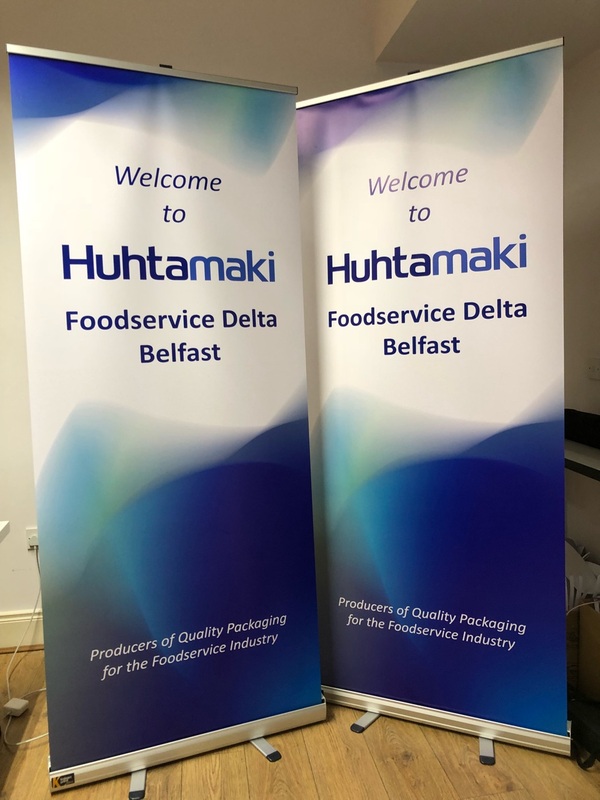 Our roller banners are printed on a 300 Micron Scratch Resistant Vinyl (Polypropylene Roller Banner Film) and printed using high quality UV Resistant inks. How long does a roller banner take to print? Roller banners can be printed in 24 hours. We also offer a 3 day lead time at a reduced cost. Shipping is in addition to this this time. What height is a roll up banner? 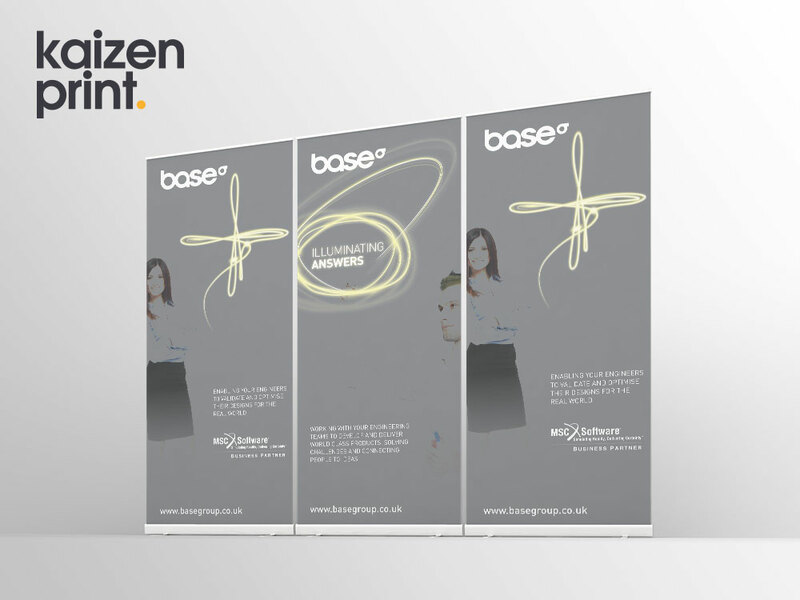 The most common height of a roll up banner in the UK is 2000mm (200cm). 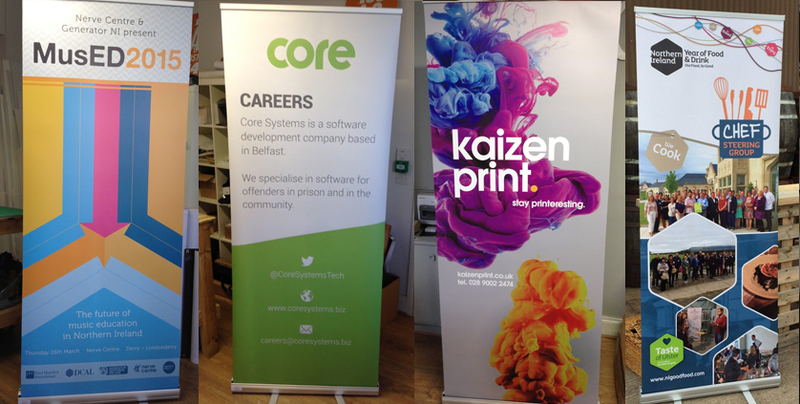 This is also the height of the roll up banners we supply here at kaizenprint.co.uk. How much does a pull up banner weigh? Our premium single sided pull up banners weigh 4.2kg and our double sided roller banners weight just over 7kg. This includes graphic, stand and carrier case. Can I buy roller banner replacement graphics? Yes, for roller banners we have supplied, we can replace the banner graphic once and maybe twice depending on how well the mechanism is looked after. To order a new graphic check out this page. We’ll install the roller banner replacement graphic free of charge. Please note the original graphic will be unusable after the replacement graphic is changed. What is the best design programme to use for roller banners? We recommend Adobe inDesign for the design of roller banners. You may of course use any programme you are familiar with, however we would steer clear of Photoshop as due to the nature of the programme, the files will be saved in extremely large sizes. All images used on a banner design should be 300dpi or in a vector format. While you may wish to use an image less than 300dpi, we will flag this with you for approval before printing, as the quality may not be high quality. How do I supply files to print a pop up banner? When printing pop up banners, the most common format to supply your files is PDF. We can also use jpg’s, however the file size can be quite large and so PDF is the preferred format. The most common size of a roll up banner is 850mm x 2000mm. 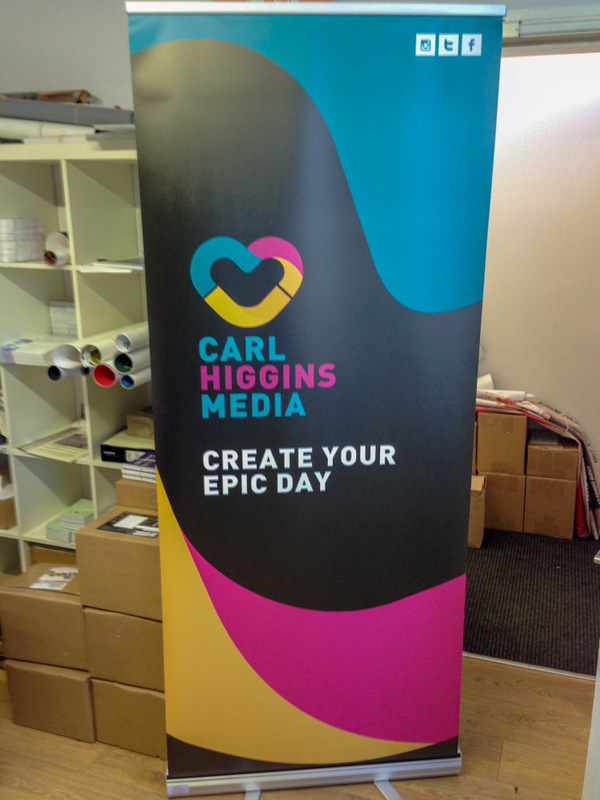 When designing a roll up banner, we need to add 3mm bleed on the top, left and right hand sides. On the bottom of your banner, please add 100mm bleed. If you are unsure of how to do this, you can download our templates on this page. Alternatively our graphic designers can create the perfect roller banner for your project. How long does a roller banner take to arrive? We offer 2 lead times for our roller banner printing. 24 hours and 3 days (plus shipping). If you need the banner in a hurry, this can be collected from our office, Monday to Friday during office hours. We offer same day delivery in Belfast via our own delivery team. Next day and 2 working day options are available for customers across the UK & Ireland. Alternatively if you want to collect from our office, this is available during office hours. Can I track my roll up banner delivery? Yes of course, we use DPD & Parcelforce for our next day and 48hr shipping. We will supply your tracking number when the banner is shipped. VAT is charged on some printed materials but not all, roller banners ARE VAT APPLICABLE and so yes, VAT must be charged on this item. For readers of this Ultimate Guide to Roller Banners we have a very special discount code offering 50% off our premium banners. Use BUYBANNERS at the checkout to avail of this special discount. This entry was posted in The Print Hub and tagged pull up banners, roll up banner, Roller Banners, rolling banner.